In the bread and confectionary industry, a key step in food processing is the baking process, which gives the final product the important characteristics for an enjoyable eating experience - appearance, smell, taste, texture and of course, safety. A variety of products, including bread loaves/rolls, pizza, pies, quiche, biscuits, crackers, pastries, cakes and other confectionary products, require the baking process to be controlled to guarantee food safety, quality, consistency and value. As part of any baking process control program, the oven temperature is critical to the temperature of the product and its baking characteristics. Controlling temperature will influence the quality of the final baked product in terms of shelf life, taste, texture, color, appearance, smell, shape/size consistency and safety. As part of most HACCP programs in the bakery sector, a key CCP will be the monitoring of the oven/chiller environment and product core temperature. In bread processing, the secondary validation process of dough prior to final baking also requires temperature and humidity control to guarantee product quality. 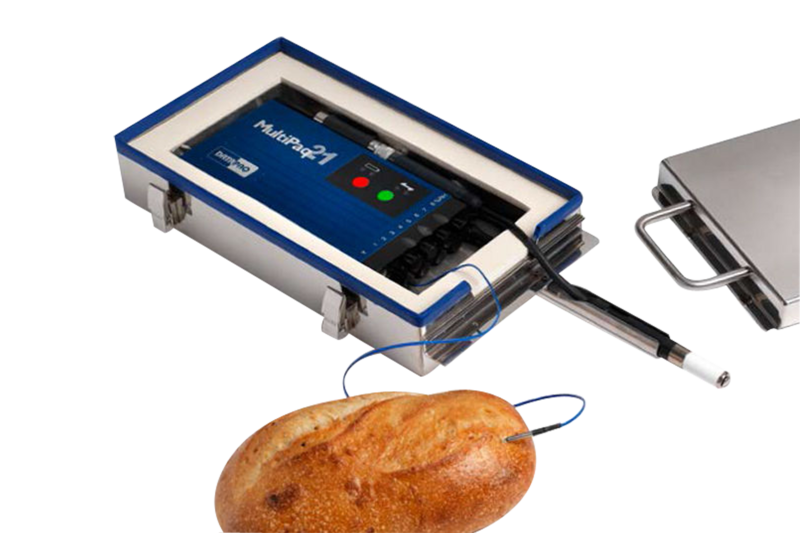 MultiPaq21 logger provides up to eight measuement channels, allowing accurate temperature uniformity measurement. Food Tracker probe jig allows quick, easy and repeatable placement of sensors, across the width of the bakery mesh belt.